Video Pipe Inspection is used to visually inspect the interiors of pipes. 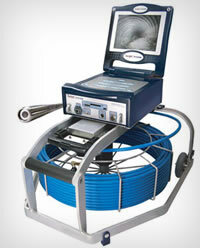 A common application is to determine the condition of small diameter sewer lines. Older sewer lines are made by the union of a number of short (10 ft) sections. The pipe segments may be made of cast iron or vitrified clay pipe, a ceramic material made from vitrified clay. Each segment will have an enlargement (a bell) on one end to receive the end of the adjacent segment. Roots from trees and vegetation may work into the joins between segments and can be forceful enough to break open a larger opening in terra cotta or corroded cast iron. Eventually a root ball will form that will impede the flow and this may cleaned out by a cutter mechanism and subsequently inhibited by use of a chemical foam - a rooticide. With modern video equipment the interior of the pipe may be inspected - this is a form of non-destructive testing. A small diameter collector pipe will typically have a cleanout access at the far end and will be quite long, terminating at a manhole. Additional collector pipes may discharge at this manhole and a pipe (perhaps of larger diameter) will carry the effluent to the next manhole, and so forth to a pump station or treatment plant.